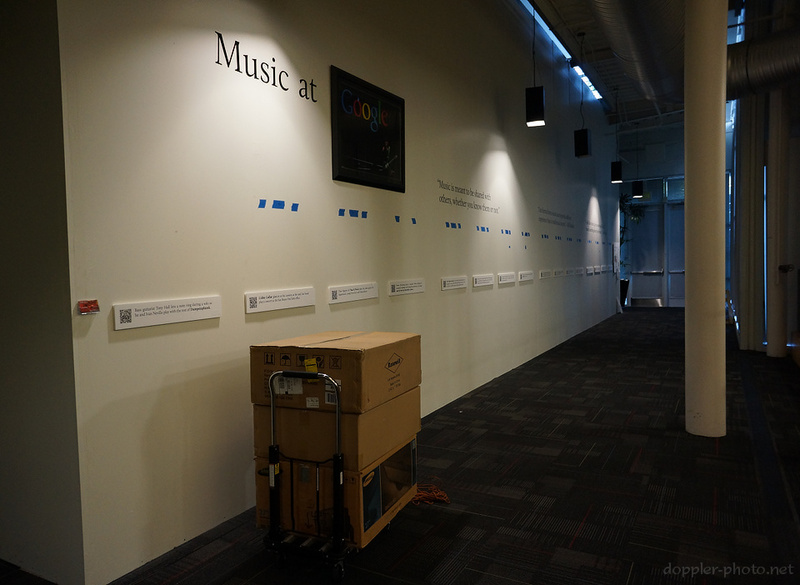 After 4.5 months up on the wall, my Music at Google exhibition has come down. It was a good run, and people seemed to enjoy it; time to move on. As a reminder, the signed, dated, and framed original prints are for sale for $350 apiece (or $500 for the title image). Each image portrays a uniquely intimate moment with a great musician, and each captures a different way that the Google concert environment helps you get to know the performer. These aren't just celebrities you see on stage at a distance, they're people who have personalities, who shoot hoops, who laugh at your jokes, and who strive to connect and identify with you. I have tried to capture a hidden glimpse of those personalities in each photo. As my idol Yousuf Karsh once said, "Within every man and woman a secret is hidden, and as a photographer it is my task to reveal it if I can. The revelation, if it comes at all, will come in a small fraction of a second with an unconscious gesture, a gleam of the eye, a brief lifting of the mask that all humans wear to conceal their innermost selves from the world. In that fleeting interval of opportunity the photographer must act or lose his prize." I hope you will agree that every image from this exhibition is a prize. Click here to see the online version of the exhibition, and send me an email at prints@doppler-photo.net to inquire about a piece. Each image was professionally printed, matted, and framed in the Bay Area. The title image is 2 feet tall and 3 feet wide (24"x36", not including mat and frame), and the story images are each 1⅓ feet tall and 2 feet wide (16"x24").